For travellers going on a regional vacation or business trip, the BAe125-400 is one viable, stylish option they must take. With its cozy interiors and considerably wide range, it certainly wouldn’t be a wonder why most leisure and business travelers continue to choose this aircraft. This 8-seating, twin engine jet also has its customizable features to fit the needs of its passengers. If you’re hopping aboard a regional flight on this plane, it would be advisable for you to ask about its facilities from your charter. This way, you’ll be ready to plan out your upcoming activities while in-flight. The BAe125-400 is a product of its predecessors and it has its improved features, particularly on the ramp and brake features for further sturdiness. Ten other planes were developed, right before the BAe125-400 got introduced as engine and component improvements were applied prior to its production. 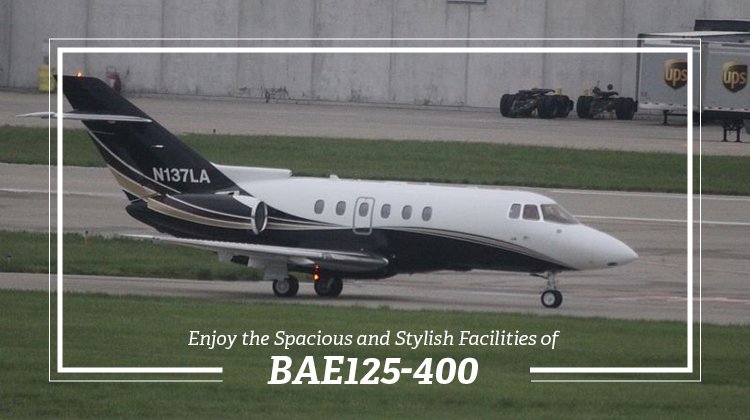 Know more about the specifications of BAe125-400, and be sure to schedule for a regional ride aboard the aircraft today. The BAe125-400 has been customized with comfy seats for regional flights. If you’re flying all the way to Colombia, you can be sure all the necessary, in-flight facilities you’ll need are in the aircraft. These include an area to prepare your drinks and snacks and compartments for your luggage. This plane is also a fit for practical flyers, who go for spaciousness and comfort above all other in-flight features. Its standard interiors include passengers seats which can be reclined and a divan. In-flight entertainment facilities may also vary, depending on the initial plan of the aircraft’s operator. This British Aerospace aircraft continues to stay competitive when it comes to performance. This midsize jet’s capacity can be quite at par even with the latest models of planes. The only difference is, it’s not as loaded with frills hence most business travellers would usually opt for this aircraft. If you’re flying for a conference, you’d be glad to know this plane has the standard amenities for you to prepare for your activities. See whether your seats may have pull out tables where you can work on your laptop. Check out other features you may need, such as WiFi and charging outlets. This way, you can stay connected especially when you’re about to alight from the aircraft upon arrival. Manufactured by aircraft experts, de Havilland, Hawker Siddeley, British Aerospace, Raytheon and Hawker Beechcraft, the BAe125-400 is a product of high quality predecessors. The British Aerospace aircraft has had three series of variants, before the BAe125-400 eventually got conceptualized and further developed. The same aircraft was also further customized to function for the Royal Air Force. Today, the British Aerospace series has the Brazilian and Japanese Air Force as its primary users, aside from commercial and private operators.